Monthly librarian visits and book deliveries to Burcham Hills Retirement Center; East Glen Apartments; The Willows at East Lansing; The Willow at Okemos; and Independence Village. Monthly children's programs at Abbot Nursery School; People’s Church Preschool; the Greater Lansing Islamic School; Kindercare; Eastminster; St. Thomas Aquinas Preschool; and the Broad Art Museum. Classroom visits and tours of the library for all ages. Regular bookclubs at Macdonald Middle School, East Lansing High School and Jimmy's Pub. Do you represent an organization that would like a visit from a librarian? 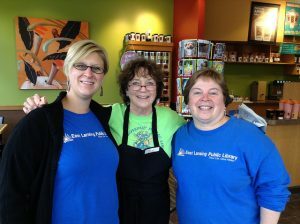 Are you a member of a group that would like to partner with the East Lansing Public Library? Please fill out the form below and tell our Community Team about your organization and how the East Lansing Public Library can help. What group or organization do you represent? How would you like ELPL staff to assist your organization? Does your group/organization have staff or volunteers available to work as partners with ELPL librarians?